A collection of ESL activities and games for teaching ordinal numbers to elementary level students (A2). It includes a lead-in activity, several classroom activities, a game and a collection of specially selected ESL resources from around the web. If you're an iOS or Android user, try this lesson out on our TEFL Handbook app. It gives you offline access to all of our materials, perfect for quick reference in the classroom. Depending on the familiarity of the class with ordinal numbers in English, the sample board work below could be used to either introduce students to the topic or serve as a useful lead-in activity. In the case of the later, elicit the ordinal numbers and spellings from the class. This optional lead-in activity depends on the class level. 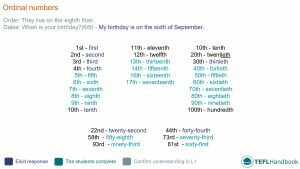 Take some time to explain the difference between cardinal and ordinal numbers. Cardinal numbers are used for counting, while ordinal numbers show the position or order of things. That student will then write the short form of their birthday for the next student to convert. Repeat this for the whole class. The swimming pool is on the twenty-seventh floor, next to the gymnasium. Mark's apartment is on the eighth floor, above Jim's apartment. This activity works well with groups of up to four. Also, depending on the level, you may want to drill the prepositions or add them to the board. A fun and challenging writing activity idea that serves as an opportunity for students to demonstrate what they have learned about ordinal numbers, while peripherally testing their knowledge of the past simple and prepositions of time. First, explain that we use the preposition on for exact dates and in for months. Then have the students write five sentences about important dates in their life. You can add the following type of prompts to the board to help them, but you should encourage them to think of their own. When did you start school? For stronger classes, you could even have them swap books with a partner and report on their partner's results in the third person. As usual, our suggestions for ESL classroom games require the minimum of resources (whiteboard and markers). We can adapt the whiteboard relay spelling game to teach ordinal numbers. First, divide the class into two teams. Write two lists of dates on the board, in short format (6/10), one for each team member. When the game begins, a student from each group will run to the board to convert a date to its written form, containing the ordinal number. When they finish, they run back to their team and hand the marker to the next student. The race ends when one of the teams finishes. Finally, count up the scores and give a point for each correctly spelt date. If you are looking for more activities to beef up your lesson planning options, have a look at these ESL resources from around the web. For an alternative approach to teaching ordinal numbers, this lesson plan template from busyteacher has some excellent ESL activity and game ideas. If you need free worksheets, islcollective has a great collection. 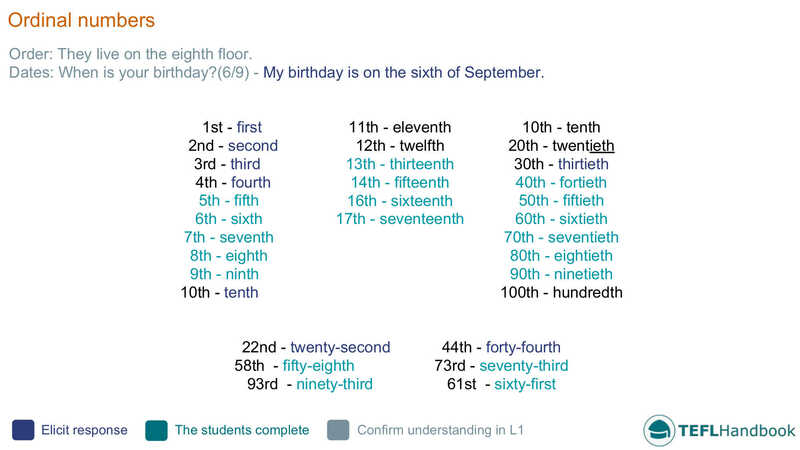 Also, this free ESL worksheet from busyteacher would serve as a fitting assessment activity for ordinal numbers. If you have a suitably equipped classroom, this video from Francesco Favero has a fantastic explanation of ordinal numbers, along with an overview of their functional application. We hope that you were able to grab a few ideas from this lesson plan. Our suggested next lesson is on the present simple. Be sure to check out our complete collection of elementary level lesson plans, A2 lower and A2 Upper. For other levels, have a look at our entire collection of ESL lesson plans. Also, if you are an iOS or Android user, the best way to view this content is through the TEFL Handbook app. An ESL lesson planner for English teachers, designed for in-class use.